Shots from, on, and around the Greenpoint Avenue Bridge. For an in depth profile of the structure, click here to visit DUGABO (Down Under the Greenpoint Avenue Bridge Onramp). 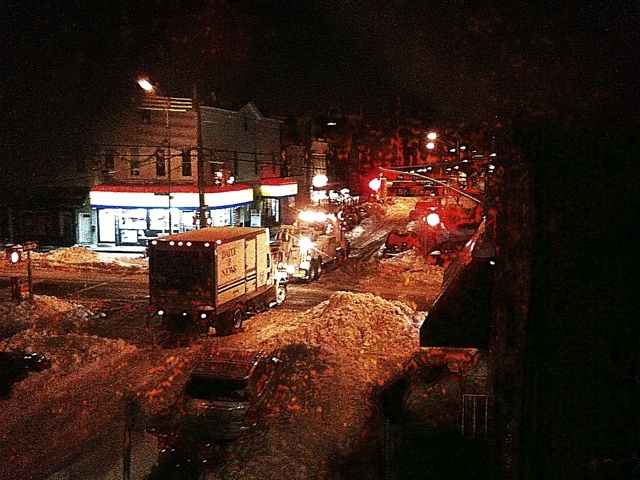 Note: Plows and salters are currently scraping Astoria clean, and Time Warner Cable’s major outage in Queens seems to have been resolved- at least here in my part of Astoria. The constituents of Council Member Jimmy Van Bramer received this message yesterday, which is presented here verbatim. Similar sentiment has been expressed to me by area wags and common gentry alike. It is hard to believe that nearly three days after snow started to fall, and two days after it stopped, hundreds if not thousands of streets and roadways have been left untouched and unplowed, endangering the safety and wellbeing of New Yorkers. Never in the history of our great city has such a gross mismanagement of a snow cleanup turned into the disastrous lack of response we see before us today. For the past two days I have trekked through the impassable sidewalks and roadways in my district, witnessing first hand the systemic failure that our Mayor seems to believe is the best job our city can do in a time of emergency. The disconnect between “Hizzoner” and the everyday people that are struggling to get out of their houses, walk down their streets and attempt to get to work to make a living is unbelievable. The people of my district, and indeed all New Yorkers need help and answers and they need them now. In the past two days my office has received over 150 complaints, emails and phone calls from distraught constituents and senior citizens who cannot walk down their streets, access their vehicles or get to the places and services they need. I am baffled as to how major roadways were left untouched and unplowed nearly 48 hours after a storm hit our city and the photographs that I have personally taken and collected from my constituents capture the chaos Queens has and is currently experiencing in the aftermath of the snowstorm. Every complaint taken by my office has been documented and filed with the the Mayor’s Office, the Speaker’s office, and the Department of Sanitation to ensure that all levels are notified of the urgency and severity of the issue at hand and to expedite the snow removal. When not on the streets of our neighborhoods, I’ve been on the phone with residents, demanding answers from City agencies, and drawing attention to this debacle in interviews with media. Something has clearly gone wrong and answers will be sought out at a City Council hearing on January 10th, which will address and examine the City’s snow emergency policy and response. My staff and I are dedicated to getting our community the services it needs and the answers it deserves and will be working around the clock to ensure that every complaint is adequately addressed. As always, please do not hesitate to call my district office, at 718-383-9566 or send us an email at JimmyVanBramer@gmail.com. I work for you. I’ll never forget that, and I’ll always be grateful for the honor and privilege. Astoria still suffers from an information blackout, as Time Warner Cable and to a larger extent- the City of New York- have once again forgotten we’re here. Most of our streets are unplowed, despite the fact that the citizenry has abided with law and custom by clearing the sidewalks. Vehicles remain stuck, including an ambulance which was mired down for an astounding 20 hours. The Daily News truck in the shot above came to a halt at 4:30 am yesterday, and the tow truck in the shot had just freed it at 11:00 pm. Shots and posts were all done on my iPhone as the main computer is isolated by Time Warner’s inability to forecast that it might snow during the winter. We’ve seen many interesting things the last couple of days, as soon as I’m web capable again- I’ll be posting. Forgive the lack of formatting, and the normal presentation- as this message is being sent via my phone. 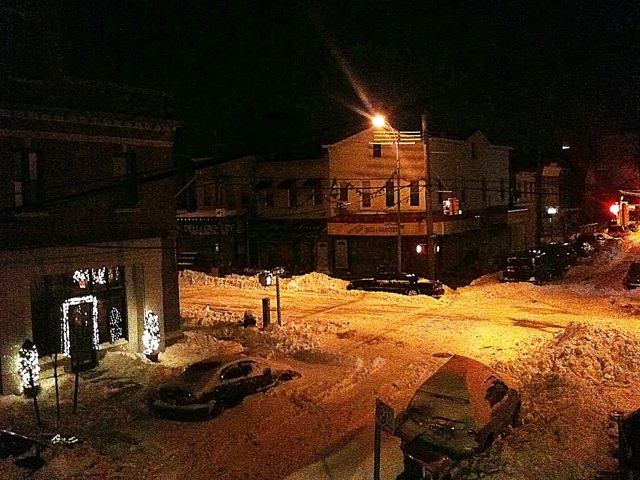 The snowpocalypse, as manifested in the silken lanes of Astoria, has led to a major Time Warner cable outage. Since Sunday night at approximately 11pm, both cable and Internet connectivity went blank. The natives are restless and deprived of emptytainment, whereas I am frustrated by inability to “do my thing”. I’ll be back as soon as the very worst of New York’s utility monopolies lets me get online again. Feels a bit like the Great Astoria Blackout of 2006, actually. Shots of and around the Kosciuszko Bridge over Newtown Creek. Shots of, from, and around the Grand Street Bridge at the currently undefended border of Brooklyn and Queens. Welcome to DUGSBO. Shallow as it is, Maspeth Creek at an extreme low tide on Wednesday the 22nd of December.